Eleven-year-old Lily Bell poises her pencil just above the faint blue line of dashes on the off-white page.She moves the lead tip to begin writing the first word of St . John’s verse about the law of love: “This is my commandment: love one another as I love you” (John 15:12).Lily’s effort may seem painstaking in its precision, but practicing cursive, she says, is actually fun. Lily and St. Joseph fifth-grader Kaitlyn Guth know a thing or two about the art of penmanship. Both were named this year’s Zaner-Bloser Pennsylvania State Grade Level winners in the annual Zaner-Bloser National Handwriting Contest. They are being considered for Zaner-Bloser’s Grand National Champion honor to be announced May 1. “Hats off to them,” says their teacher, James Steudler, who has been instructing students in the proper methods of cursive for the past 38 years. During his career, he has taught at St. Joseph and at Holy Rosary School in Johnsonburg. At age 63, Steudler represents the generation raised in the Palmer Method of handwriting. Penmanship was once considered a mainstay at all levels of education, both public and private.But with the advent of computers, cell phones and keyboard instruction, handwriting seemed to be “put on the back burner,” he says. Common Core standards do not require teaching cursive in public schools, but in the Diocese of Erie, it is expected, says Kim Lytle, curriculum director of diocesan schools. “A growing body of research by psychologists and neuroscientists indicates that cursive helps to improve student comprehension of texts and to transform ideas into the written word,” Lytle says. 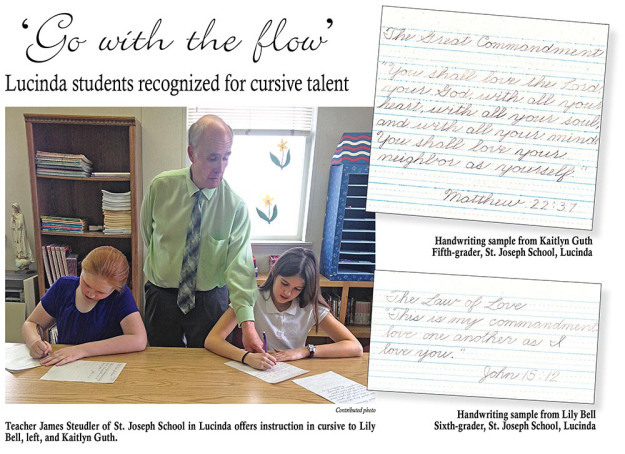 At St. Joseph, Steudler teaches his fourth- through sixth-graders the basic strokes of cursive, positioning of paper and pencil, and posture. He incorporates cursive in each academic subject. During his tenure, St. Joseph has had 13 state grade-level handwriting winners, two national-level winners, and one student named grand national champion two years in a row. Principal Betsy Ochs believes students who practice cursive become better readers and writers. Cursive offers another benefit: pride. For grade-level winner Kaitlyn Guth, cursive is more “proper and prettier” than printing. She thinks everyone should give it a try. This entry was posted in Uncategorized on April 25, 2018.